The founders of HATD-grantee Ahli Balatah Al-Balad Club (ABBC) in Nablus had envisioned an organization that would serve women and youth who lacked access to basic social and cultural services. Despite this vision, the Club became male-dominated and very few women visited the center since its founding in 1995. All this changed in 2017 when Healing Across the Divides awarded ABBC a three-year grant to combat chronic disease. Through a unique program in which a select group of women are trained to educate others in disease self-management, members of the community are now provided with the tools to maintain their own health through diet, exercise and awareness about chronic disease. While the program continues to have immense success in battling diabetes, its impact has been profound in other ways as well. For the first time in years, the club is frequented and accessible to women of all ages. 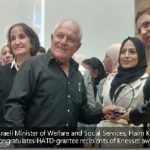 Thanks to the support of HATD coupled with the dedication of the program’s Project Manager, Ms. Najwa Al-Hasan, local women are now strongly encouraged to participate in this life-saving program—the Club’s initial purpose of serving both male and female Palestinians is finally being realized. Najwa worked to engage women who would otherwise not have benefited from the program. Many women expressed interest in learning how to manage their disease but were uncomfortable attending sessions at the Club because it had traditionally served only men. Women began to trust Najwa and slowly but surely women from all parts of Nablus began attending sessions at the Club. 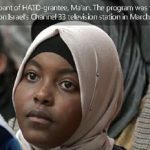 Najwa even spearheaded a volunteer program that included more than 20 dedicated students—both male and female—who help promote HATD’s program. Women’s involvement in the health sessions subsequently opened doors to further engagement, and the Club now organizes other events that encourage women’s participation. With the help of ABBC’s Executive Board, Najwa has been able to offer embroidery classes for women as well as conduct awareness sessions that help empower women to seek employment and higher education. For the first time since the opening of the Club, a co-ed winter and summer camp have been implemented. 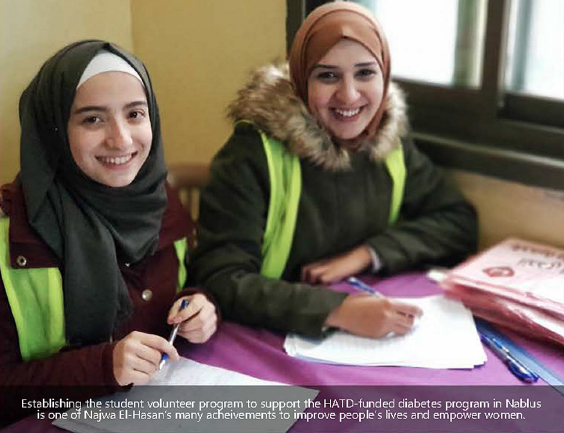 Najwa’s commitment to empower diabetes patients and women have gained her recognition throughout Nablus, and people often stop her on the street to thank her for the work she has done for the community and women.